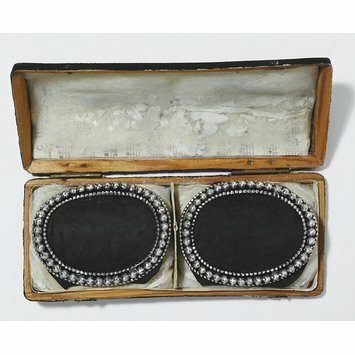 Shoe buckles made in cut and polished steel were a fashionable accessory at the end of the 18th century. 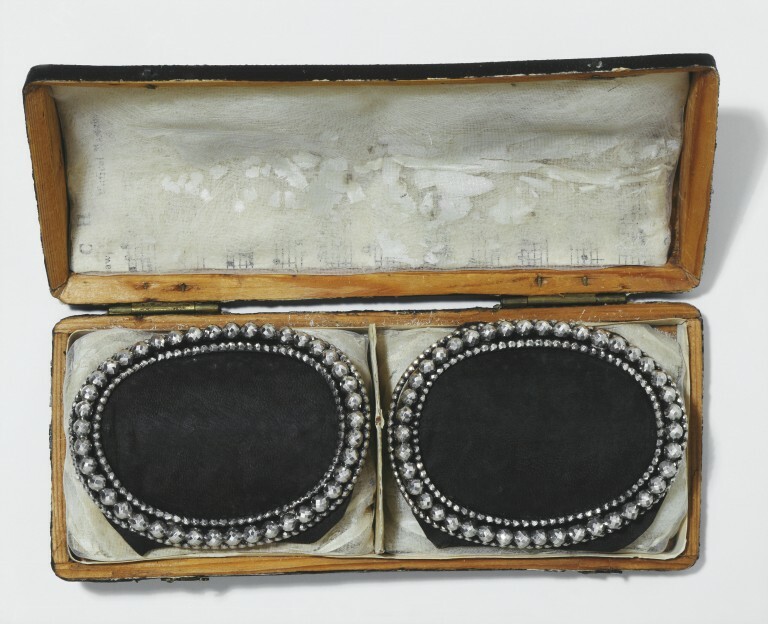 Cut-steel shoe buckles remained an essential part of formal court dress until well into the 20th century. The main centres of production of shoe-buckles were in the Midlands, especially Wolverhampton and Birmingham. Woodstock near Oxford and Salisbury in Wiltshire also had a number of small workshops producing high-quality and expensive buckles. Many buckles must have been bought by a retailer from these local manufacturers, then offered for sale from fashionable addresses in London's New Bond Street. Like many London retailers, the C. Wades whose name and address appears on the shagreen case made for these buckles, sold other fashionable fashion accessories, such as swords, watches and jewellery. Although these silver buckles bear no date letter, they must date from before 1794, when the name and address of the retailer changed. Mary Whitford and William Ballantine are recorded as buckle-makers in 1778.